The plan involves upgrading the upper stage of SpaceX's workhorse Falcon 9 rocket "to be like a mini BFR Ship," Musk said via Twitter Wednesday (Nov. 7). 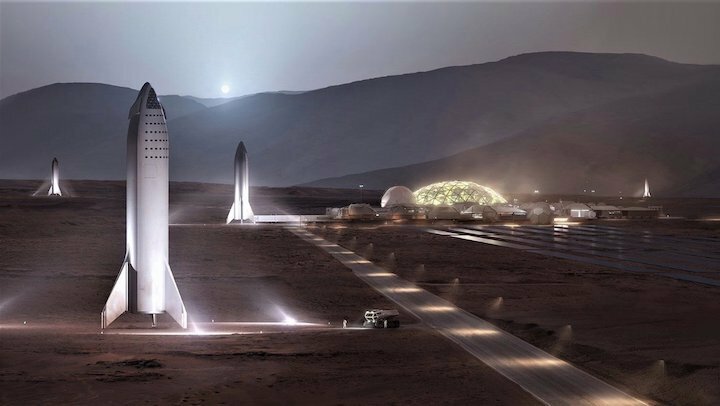 An artist's illustration showing SpaceX BFR spaceships on the surface of Mars. The upcoming Falcon 9 modification will apparently help SpaceX better understand some of the more demanding flight regimes the BFS will experience. "Ultra light heat shield & high Mach control surfaces are what we can't test well without orbital entry," Musk said in another tweet. The newly redesigned upper stage won't make a propulsive landing here on Earth, as about 30 Falcon 9 first stages have done to date (and as the BFS will do on the surface of Mars, the moon and other cosmic destinations), Musk said. "I think we have a handle on propulsive landings," he tweeted. In yet another tweet, he added that SpaceX is building a "BFR dev ship to do supersonic through landing tests in Boca Chica, Texas." That site in South Texas will be the company's hub for BFR and BFS testing, SpaceX representatives have said. 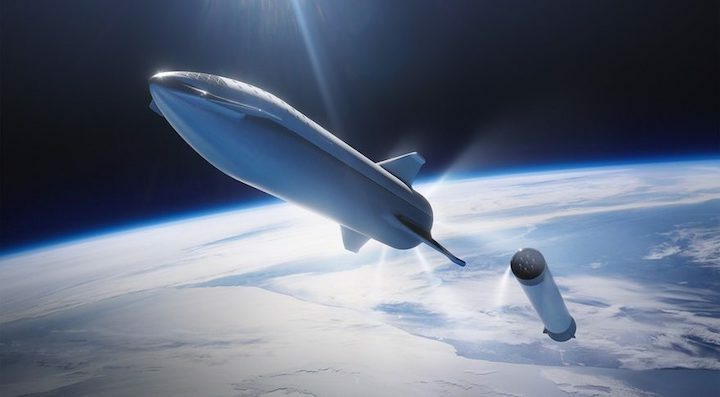 If everything goes well with BFR-BFS development, the duo could begin carrying people to Mars by the mid-2020s, according to Musk. The long-term goal is to help establish a million-person city on the Red Planet — ideally, within the next 50 to 100 years. SpaceX envisions handing over all of its spaceflight work to the BFR and BFS eventually. The system will be able to do all that SpaceX asks of it, from launching satellites to Earth orbit to cleaning up space junk to ferrying people on superfast "point to point" trips here on Earth, Musk has said. WASHINGTON — SpaceX Chief Executive Elon Musk said Nov. 7 that his company will attempt an orbital flight of a reusable version of a Falcon 9 upper stage by the middle of next year to test technologies for the company’s next-generation launch vehicle. In a series of tweets, Musk announced a “mod,” or modification, to the “SpaceX tech tree build.” That is an apparent reference to a path of upgrades the company is pursuing as it develops its Big Falcon Rocket (BFR), a fully reusable launch system. In later comments, Musk indicated the revision is intended to test technologies needed for the full-scale BFR spaceship. “Ultra light heat shield & high Mach control surfaces are what we can’t test well without orbital entry,” he said in response to a question from another person. The upgraded stage would not be used to test landings. “I think we have a handle on propulsive landings,” he said, later noting that the company is building a “BFR dev ship” intended to test landings at the company’s South Texas spaceport under development. Musk and other company officials have said initial “hop tests” of that vehicle could begin by late next year. SpaceX did not provide additional details on the concept announced by Musk on Twitter, including the status of the development of that modified upper stage or whether this was intended to be a one-time test versus using that modified stage for launching payloads. SpaceX has considered reusing the second stage of the Falcon 9 on and off for years. In 2011, the company released a video showing the rocket’s first and second stages, as well as a Dragon spacecraft being launched by the rocket, making propulsive landings on land. While the company now routinely lands first stages, either on land or on droneships in the ocean, it has not pursued plans to reuse the second stage, which poses greater technical challenges given the higher speeds at which it travels. At a press conference after the March 2017 launch of the first reused Falcon 9 first stage, Musk said the company might try a “Hail Mary” and attempt to recover an upper stage on a future mission. SpaceX hasn’t made such an attempt, but in April Musk tweeted that SpaceX would attempt to use a “giant party balloon” to bring back the upper stage, which many interpreted as some kind in inflatable decelerator similar to those tested by NASA. The stage would then be caught by a ship like the one SpaceX currently uses in efforts to recover payload fairings. At a May press conference prior to the first flight of the Block 5 version of the Falcon 9, Musk said the company was still collecting data on how to potentially recover the upper stage. “Gradually, over the course of this year, we’ll be adding more and more thermal protection to the upper stage, and try to see what’s the least amount of mass necessary to return the upper stage in a condition that is reusable,” he said.